You are in: Home > News > CODiE Award Finalist for Best Solution for Special Needs Students. WASHINGTON, D.C. (March 31, 2014) Inclusive Technology Ltd, today announced that ChooseIt! Maker 3 was named a finalist for the 2014 SIIA Education CODiE Awards for Best Solution for Special Needs Students. The SIIA CODiE Awards are the premier awards for the software and information industries and have been recognizing product excellence for 29 years. The awards have over 75 categories and are organized by industry focus of Content, Education, and Software. ChooseIt! 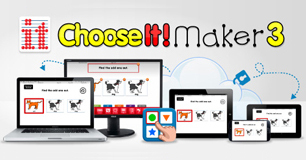 Maker 3 allows teachers to create, edit and play personalised learning materials (including choice making activities) that can be used in your classroom and with individual students securely online and then downloaded to your iPad or Android tablet! “Inclusive are extremely pleased to be selected as a finalist for the CODiE Awards. The interest in this product has been enormous. We now have an established global network of 5,000 SEN school subscribers in 52 countries. For this we thank the teachers, therapists, carers and parents for choosing ChooseIt! Maker 3!” said Martin Littler, Chairman/CEO of Inclusive Technology. SIIA is the leading association representing the software and digital content industries. SIIA represents approximately 800 member companies worldwide that develop software and digital information content. Information technology (IT) and software security are critical issues to SIIA’s members, many of whom strive to develop safe, secure and state-of the-art products that effectively serve their commercial and government customers alike, while protecting their intellectual property. The SIIA Education Division serves and represents more than 200 member companies that provide software, digital content, and other technologies that address educational needs. The Division shapes and supports the industry by providing leadership, advocacy, business development opportunities, and critical market information.